If you asked Scooter, “Were you satisfied with your summer/fall this year?” I am sure he would say and emphatic NO! Hall has high expectations for himself. He has experienced nagging injuries on and off the last few months and that has taken him off the floor. Getting on the floor for Scooter is a key factor to his success because the young AVC team has to get used to his rocket passes that lead to easy scores. If yesterday’s practice is a harbinger of Hall’s health and how his team has finally understood always to be ready for one of his laser passes, things are coming together for AVC just at the right time. Scooter’s speed looked to be close to 100% and every player on the floor was ready for the laser passes that he dished out that led to stunning easy scores. Makes everyone wants to run the floor. I did have to wince at least three times at practice when Charles took bone rattling charges. Looks like he might need full body icing after that workout. 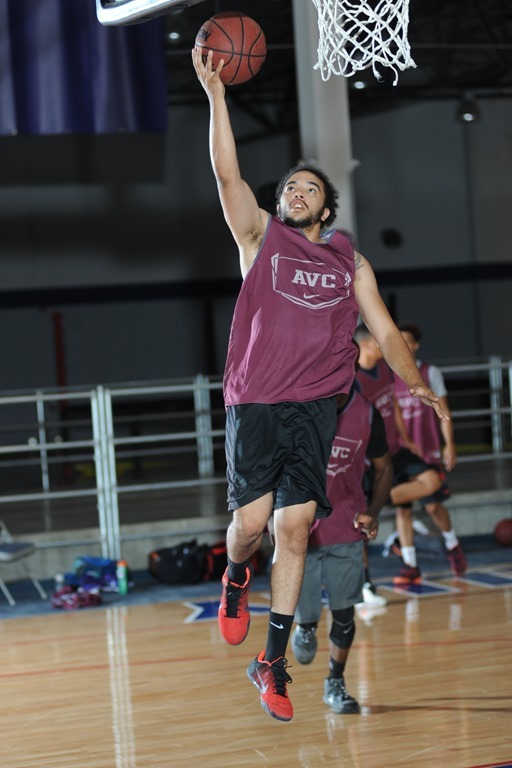 The line of university coaches that have visited AVC have shown interest in Hall and they yet to see him at his best. Should be and interesting year for the very versatile Mr. Hall.